In times of joy, bereavement, and uncertainty, seekers of all backgrounds have turned to Therese of Lisieux, the Little Flower, asking her intercession for healing and guidance. Shower of Heavenly Roses features the touching and inspirational stories of dozens of men and women whose petitions were answered with miracles large and small. Whether you are struggling with a major life transition, loss, and despair, or just looking to deepen your faith, these stories will inspire you to a greater appreciation of the power of prayer and miracles in our daily lives. As a lifelong fan of St. Therese, I offer an enthusiastic ‘Thumbs Up!’ for Shower of Heavenly Roses. The stories of her intercessions range from tender to stunning, and involve such ordinary people that any reader will feel right at home. Author Elizabeth Ficocelli has done a wonderful job helping us get to know this thoroughly modern saint. Shower of Heavenly Roses is a rich collection of stories of the friendship of St. Therese of Lisieux. These modern women and men whose lives have been changed by the Little Flower’s intercession are articulate and fascinating witnesses to the absolute reality of what Catholics call the Communion of Saints: the life-giving power of God’s love, breaking the boundaries of even time and space. Wow! I recently came across your book, Shower of Heavenly Roses. Although I’m sure that I’ve heard of her before, I really had no idea who St. Therese of the Little Flower was. WOW!!! What an eye opener!!! Instead of skimming, it’s hard to put it down, so I’m spacing it out each day. Solid addition to Theresian literature. There are literally hundreds of books about St. Therese of Lisieux and her spirituality, but I don’t think that in recent times there has been one quite like this one. 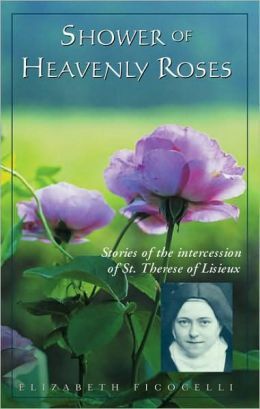 This book is a lovely compilation of stories relating St. Therese’s “intervention” in the lives of those who love her still. Yet, there is not a trace of saccharine sentimentality or trite ritualism here. The stories, some of them quite simple, are pure reaffirmations of faith. Prayer, St. Therese once noted, is a loving glance towards heaven. This volume recounts Therese’s own loving glances towards earth. It is difficult not to be touched to the point of tears when reading and rereading this book, which I call ‘The Handbook of Heavenly Guidance’! Amazing & breathtaking…so fascinating and peaceful! This book is a testament of God’s Power and Love for ALL OF US and a Saint that truly sends us down roses from Heaven… These stories are real and so inspiring. This book will not only change your life, you will only want to read one story (about 2-3 pages) each at a time, you will never want it to end. Re-read it, pass it on…you will be hooked.